Hypovolemic shock is one of the most common cardiac complications. In hypovolemic shock, reduced intravascular blood volume causes circulatory dysfunction and inadequate tissue perfusion. Vascular fluid volume loss causes extreme tissue hypoperfusion. Fluid loss. Fluid loss can either be internal or external fluid loss. Compensatory mechanism.The resulting drop in the arterial blood pressure activates the body’s compensatory mechanisms in an attempt to increase the body’s intravascular volume. Venous return. Diminished venous return occurs as a result of the decrease in arterial blood pressure. Preload. The preload or the filling pressure becomes reduced. Stroke volume. The stroke volume is decreased. Cardiac output.Cardiac output is decreased because of the decrease in stroke volume. Arterial pressure.Reduced mean arterial pressure follows as the cardiac output gradually decreases. Compromised cell nutrients. As the tissue perfusion decreases, the delivery of nutrients and oxygen to the cells are decreased, which could ultimately lead to multiple organ dysfunction syndrome. Hypovolemic shock usually results from acute blood loss- about one-fifth of the total volume. Internal fluid loss. Internal fluid losses can result from hemorrhage or third-space fluid shifting. External fluid loss. External fluid loss can result from severe bleeding or from severe diarrhea, diuresis, or vomiting. Inadequate vascular volume. Inadequate vascular volume leads to decreased venous return and cardiac output. Hypovolemic shock requires early recognition of signs and symptoms. Hypotension. Hypovolemic shock produces hypotension with narrowed pulse pressure. Cognitive. The patient experiences decreased sensorium. Tachycardia. The body compensates for the decreased cardiac output by pumping faster than normal, resulting in tachycardia. Rapid, shallow respirations. Due to the decrease in oxygen delivery around the body systems, the respiratory system compensates by rapid, shallow respirations. Oliguria. There is oliguria or decreased urine output of less than 25ml/hour. Clammy skin. The patient develops cool, clammy, and pale skin. Early detection. Recognize patients with conditions that reduce blood volume as at-risk patients. Accurate I&O. Estimate fluid loss and replace, as necessary, to prevent hypovolemic shock. Acute respiratory distress syndrome.Acute respiratory distress syndrome occurs when fluid builds up in the tiny, elastic air sacs in the lungs. Acute tubular necrosis. Acute tubular necrosis is a kidney disorder involving damage to the tubule cells of the kidneys, which can lead to acute kidney failure. Disseminated intravascular coagulation. Disseminated intravascular coagulation is a pathological process characterized by a widespread activation of the clotting cascades that results in the formation of blood clots in the small blood vessels. Multiple organ dysfunction syndrome. Multiple organ dysfunction syndrome is the end result of hypovolemic shock. No single symptom or diagnostic test establishes the diagnosis or severity of shock. Laboratory findings. There is elevated potassium, serum lactate, and blood urea nitrogen levels. Urine characteristics.The urine specific gravity and urine osmolality are increased. Blood considerations. Decreased blood pH, partial pressure of oxygen, and increased partial pressure of carbon dioxide. Emergency treatment measures must include prompt and adequate fluid and blood replacement to restore intravascular volume and raise blood pressure. Volume expansion. Saline solution or lactated Ringer’s solution, then possibly plasma proteins or other plasma expanders, may produce adequate volume expansion until whole blood can be matched. Pneumatic antishock garment. A pneumatic antishock garment counteracts bleeding and hypovolemia by slowing or stopping arterial bleeding; by forcing any available blood from the lower body to the brain, heart, and other vital organs; and by preventing return of the available circulating blood volume to the legs. Treat underlying cause. If the patient is hemorrhaging, efforts are made to stop the bleeding or if the cause is diarrhea or vomiting, medications to treat diarrhea and vomiting are administered. Redistribution of fluid. Positioning the patient properly assists fluid redistribution, wherein a modified Trendelenburg position is recommended in hypovolemic shock. Vasoactive drugs. Vasoactive drugs that prevent cardiac failure are given. Insulin is administered if dehydration is secondary to hyperglycemia. Desmopressin (DDAVP). Desmopressin is administered for diabetes insipidus. Antidiarrheal drugs. If dehydration is due to diarrhea, antidiarrheal medications are administered. Antiemetics. If the cause of diarrhea is vomiting, antiemetics are given. Primary prevention of shock is an essential focus of nursing care. History. The history is vital in determining the possible causes and in determining the work-up. Vital signs. Vital signs, prior to arrival at the emergency department, should also be noted. Trauma. In patients with trauma, determine the mechanism of injury and any information that may heighten suspicion of certain injuries. Risk for metabolic acidosis related to a decrease in the amount of blood in the capillaries. Deficient fluid volume related to active fluid loss. Self-care deficit related to physical weakness. Maintain fluid volume at a functional level. Report understanding of the causative factors of fluid volume deficit. Maintain normal blood pressure, temperature, and pulse. Maintain elastic skin turgor, most tongue and mucous membranes, and orientation to person, place, and time. Nursing care focuses on assisting with treatment targeted at the cause of the shock and restoring intravascular volume. Safe administration of blood. It is important to acquire blood specimens quickly, to obtain baseline complete blood count, and to type and crossmatch the blood in anticipation of blood transfusions. Safe administration of fluids. The nurse should monitor the patient closely for cardiovascular overload, signs of difficulty of breathing, pulmonary edema, jugular vein distention, and laboratory results. Monitor weight. Monitor daily weight for sudden decreases, especially in the presence of decreasing urine output or active fluid loss. Monitor vital signs. Monitor vital signs of patients with deficient fluid volume every 15 minutes to 1 hour for the unstable patient, and every 4 hours for the stable patient. Oxygen administration. Oxygen is administered to increase the amount of oxygen carried by available hemoglobin in the blood. Maintained fluid volume at a functional level. Reported understanding of the causative factors of fluid volume deficit. Maintained normal blood pressure, temperature, and pulse. Maintained elastic skin turgor, most tongue and mucous membranes, and orientation to person, place, and time. Degree of deficit and current sources of fluid intake. I&O, fluid balance, changes in weight, presence of edema, urine specific gravity, and vital signs. Functional level and specifics of limitations. Needed resources and adaptive devices. Availability and use of community resources. A: A person experiencing shock may have lost a significant amount of body fluid which needs to be replaced. B, C, and D: These options are not included in the treatment for shock. Which of the following intravenous solutions is least useful, and possibly harmful, as the initial resuscitation solution in a patient with a head injury who has blood loss? D: Hypertonic saline takes out the water out of the cells which could further lead to dehydration and shock. A: 5% dextrose in water is seldom used for patients with shock. B: Normal saline solution could be administered during shock but not as the main IV solution. C: Lactated Ringer's is the solution of choice for patients in shock. Which of the following causes of circulatory insufficiency can lead to shock as a result of decreased plasma volume? Penetrating trauma with blood loss. D: All of the options are causes of circulatory insufficiency that could lead to shock. A, B, and C: Penetrating trauma with blood loss, gastrointestinal bleeding, and anaphylaxis because of medications could cause circulatory insufficiency leading to shock. Which of the following medications is least likely to alter the usual presentation of patients presenting with hypovolemic shock? D: Cephalexin is an antibiotic, which could not alter the presentation of a patient with hypovolemic shock since it is for infection. A: Metoprolol is a beta-blocker that affects the heart and circulation (blood flow through arteries and veins). B: Diltiazem is a calcium channel blocker. It works by relaxing the muscles of your heart and blood vessels. Diltiazem is used to treat hypertension (high blood pressure), angina (chest pain), and certain heart rhythm disorders. C: Furosemide could greatly alter the usual presentation of a patient with hypovolemic shock in a negative way as this drug promotes passage of fluids through the urine. A patient who is in hypovolemic shock has the following clinical signs: Heart rate 120 beats/minute, blood pressure 80/55 mmHg and urine output 20ml/hr. After administering an IV fluid bolus, which of these signs if noted by the healthcare provider is the best indication of improved perfusion? Heart rate drops to 100 beats/minute. Urine output increases to 30mL/hour. Systolic blood pressure increases to 85 mmHg. C: An increase in the urine output indicates that perfusion is improving. A, B, and D: These options are not indicative of an improved perfusion. 1. Answer: A. Intravenous fluids. A: A person experiencing shock may have lost a significant amount of body fluid which needs to be replaced. B, C, and D: These options are not included in the treatment for shock. 2. Which of the following intravenous solutions is least useful, and possibly harmful, as the initial resuscitation solution in a patient with a head injury who has blood loss? A. 5% dextrose in water. 2. Answer: D. Hypertonic saline. D: Hypertonic saline takes out the water out of the cells which could further lead to dehydration and shock. A: 5% dextrose in water is seldom used for patients with shock. B: Normal saline solution could be administered during shock but not as the main IV solution. C: Lactated Ringer’s is the solution of choice for patients in shock. 3. Which of the following causes of circulatory insufficiency can lead to shock as a result of decreased plasma volume? A. Penetrating trauma with blood loss. C. Anaphylaxis because of medications. D: All of the options are causes of circulatory insufficiency that could lead to shock. A, B, and C: Penetrating trauma with blood loss, gastrointestinal bleeding, and anaphylaxis because of medications could cause circulatory insufficiency leading to shock. 4. Which of the following medications is least likely to alter the usual presentation of patients presenting with hypovolemic shock? D: Cephalexin is an antibiotic, which could not alter the presentation of a patient with hypovolemic shock since it is for infection. A: Metoprolol is a beta-blocker that affects the heart and circulation (blood flow through arteries and veins). B: Diltiazem is a calcium channel blocker. It works by relaxing the muscles of your heart and blood vessels. Diltiazem is used to treat hypertension (high blood pressure), angina (chest pain), and certain heart rhythm disorders. C: Furosemide could greatly alter the usual presentation of a patient with hypovolemic shock in a negative way as this drug promotes passage of fluids through the urine. 5. 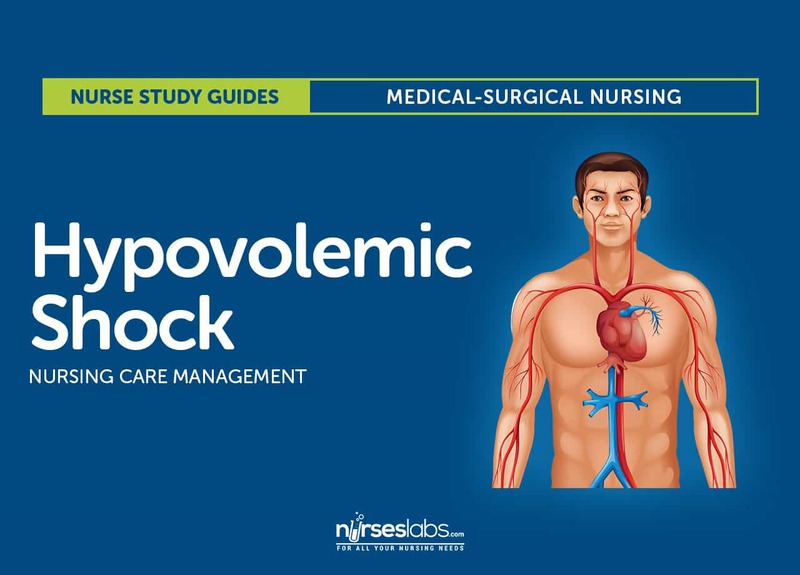 A patient who is in hypovolemic shock has the following clinical signs: Heart rate 120 beats/minute, blood pressure 80/55 mmHg and urine output 20ml/hr. After administering an IV fluid bolus, which of these signs if noted by the healthcare provider is the best indication of improved perfusion? A. Heart rate drops to 100 beats/minute. B. Right atrial pressure increases. C. Urine output increases to 30mL/hour. D. Systolic blood pressure increases to 85 mmHg. 5. Answer: C. Urine output increases to 30mL/hour. C: An increase in the urine output indicates that perfusion is improving. A, B, and D: These options are not indicative of an improved perfusion.